The golden era of Italian horror dates from the early 60’s to the mid 80’s. 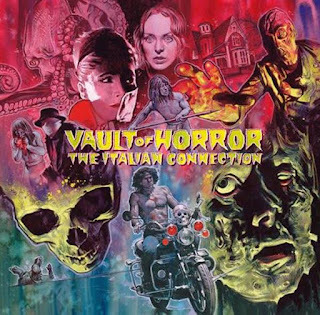 During that time directors such as Mario Bava, Dario Argento, Lucio Fulci, Antonio Margheriti, Umberto Lenzi, Joe D’Amato, and Enzo. G. Castellari directed some of the most outrageous terror films ever. As well as depicting some of the most stylish and horrific on screen images their films included some of the most elegant and beautiful scores. The cult following for their movies is as popular now as it’s ever been. The truly stunning, exclusive sleeve has been painted by renowned graphic designer & commercial artist Graham Humphreys and the biographical notes on each track are written by author, critic and FrightFest director Alan Jones. As an added bonus Demon Records are including a CD version in a replica card wallet as well as a stunning 12x12” reproduction collector’s art print of the sleeve painting. For a taster, view the trailer on YouTube.